Perrin Turbo Heat Shield SUBARU - Dezod Motorsports Inc - Home of the automotive performance enthusiast since 2002. Don’t leave your turbo uncovered! Protect your intercooler from radiant heat from your turbo! The PERRIN turbo heat shield is CNC formed from 304 stainless steel. The backside of the shield is cut to fit all aftermarket downpipes. It is also adjustable front to back allowing the tuner to cover as much of the turbo as possible from application to application. High quality stainless steel hardware included. The PERRIN turbo heat shield covers more of the turbo charger, leaving less of the exhaust housing exposed. Our shield covers the top of the downpipe, the sides of the turbo and sits snuggly around the wastegate arm. All to help keep heat under the shield where it belongs! The PERRIN turbo heat shield is adjustable to allow the shield to be pulled over the turbo as much as possible. The PERRIN shield uses spot welds, instead of rivets. When spot welds are done correctly, they will hold just as good as any bolts or rivet and will not loosen over time. 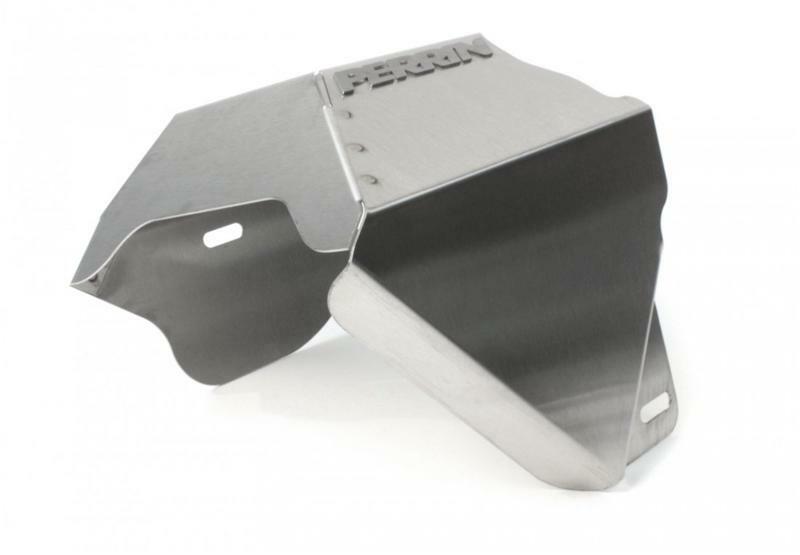 The PERRIN Heat shield uses only high quality spot welds that pass the “Nugget Test”. During a production run We actually rip apart a test joint. The sheet metal should fail before the weld, leaving a small “nugget” of metal behind. verifying the spot weld penetrated all layers of metal. The PERRIN turbo heat shield is perfect for those not wanting to cut the OEM turbo heat shield when installing our PERRIN down pipe. The PERRIN heat shield covers more of the turbo than competitors shield. The PERRIN heat shield has a brushed stainless finish.